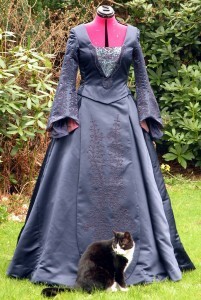 Note: If you always wanted to have the original burnout silk velvet with the flames pattern that was used for this gown – that fabric, by now, has practically turned into Unobtainium. 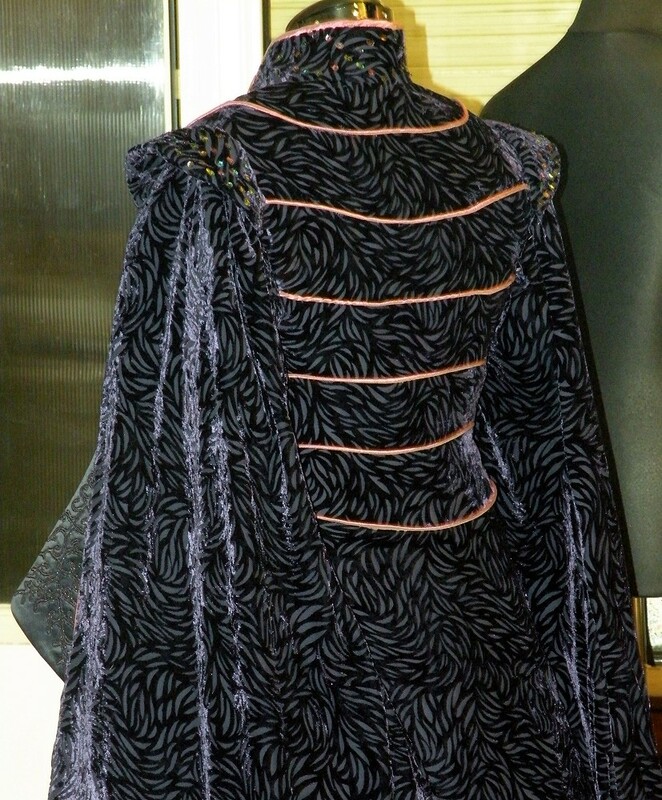 I do still have some of the two bolts I originally bought in 2003 but already agreed to make one more Senate gown for someone. However, there’s a printed version of the flames design available here on Spoonflower. 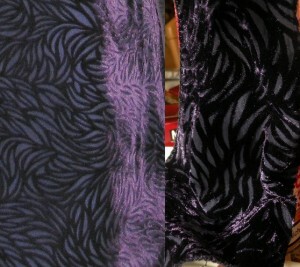 The fabric offered there is NOT burnout velvet. 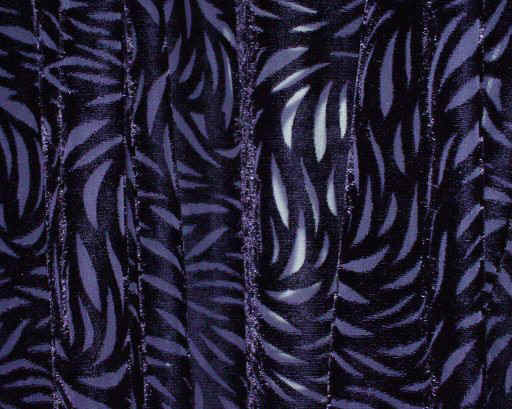 It’s not even printed velvet. 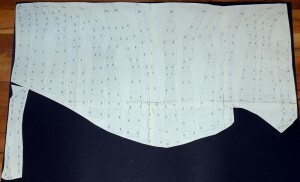 Spoonflower prints the design on the fabric you chose from their selection. 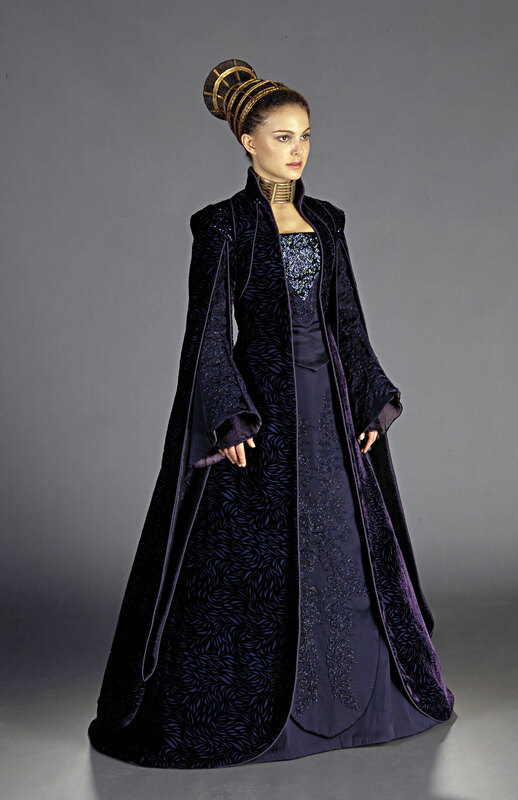 That is the same technique I used to create my Senator Amidala Travel dress. 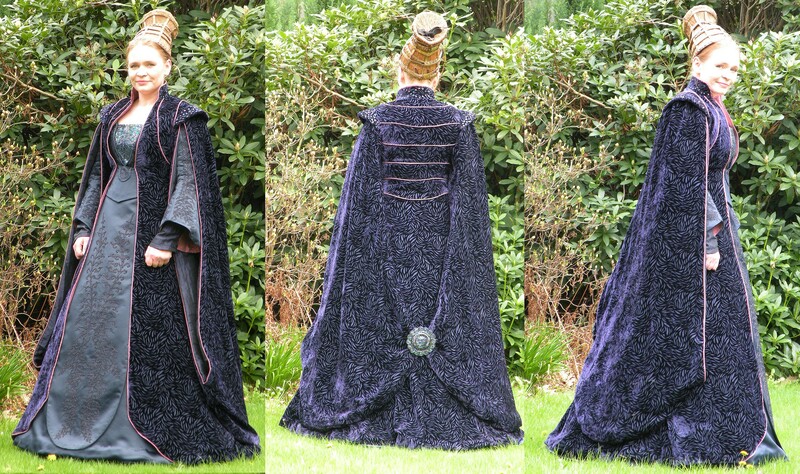 I have reproduced this costume twice – once in 2003 for someone else; pictures of that reproduction can be found down the page. The progress on my second reproduction in 2013 (10 years later) is posted on top of this page. The second reproduction will be closer to the original than the first one as since 2003, better pictures – particularly exhibit pictures! – surfaced. I was working on a (different!) “surprise” costume for CEII, when I remembered that I still have a full bolt of the silk/rayon ‘flame’ velvet of the purple Senate gown from Episode 2 (I bought 2 bolts ten years ago, as described below for the first costume which I made ten years ago…); so I could have made that one as well (instead of the surprise costume which I actually made, that is). The idea nagged me. For weeks. And finally I gave in (thanks to my son who also nagged me to make it). I’m not quite sure if I can pull that gown off until CEII, but I just HAVE to try. So here’s my progress. I started with the most time consuming things because I know that I tend to lose interest if I am stuck doing things that, well, need much time. 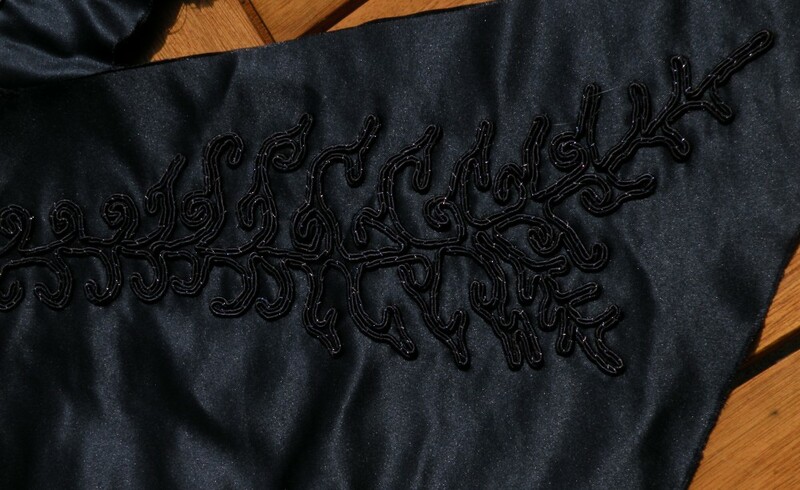 So I figured that instead of doing the actual sewing on the dress first, I’d start with the beading and cording embroideries – that way I won’t waste time doing the “simple stuff” (=sewing) first, but can do it last, so I know that my speed will pick up towards the end. During the past five days I’ve done nothing but beading. Here’s the result after five days (of which I took one day off from beading). 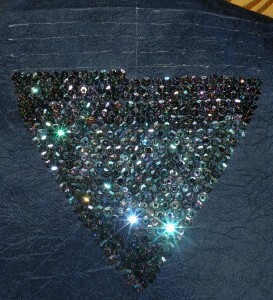 If you click on the ‘triangle’ photo to see it larger, you will notice that the beads at the center of the sequins have many different sizes and shapes. 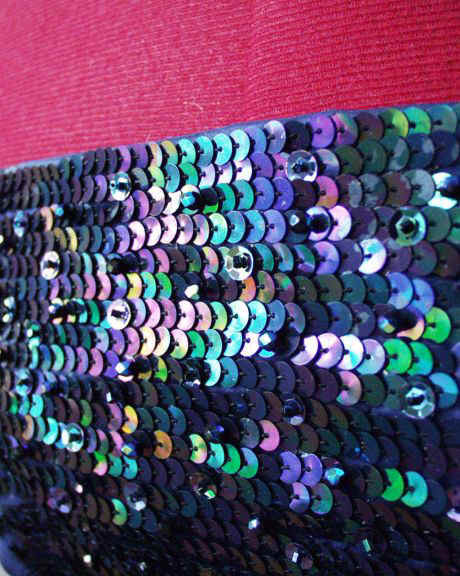 This is because I’m not just using cupped iridescent black sequins and seed beads. 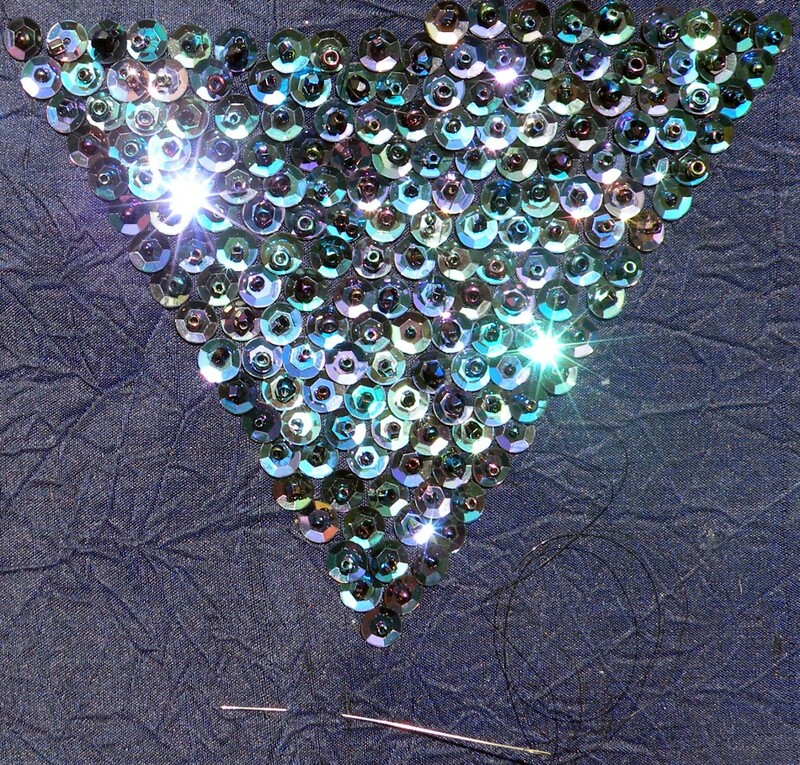 In fact I’m using a variety of round and cut seed beads, hex cut beads and cut glass beads, all in various shades of “iridescent” (black-, blue- and purple iridescent, that is) on top of the sequins. 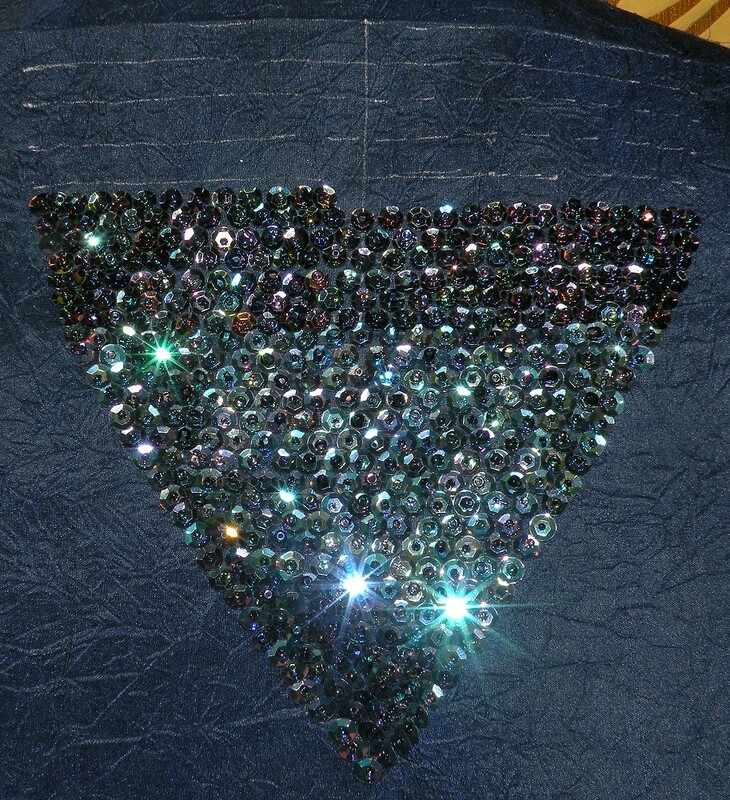 Also, for the brooch I didn’t just use “straight” bugle beads but also twisted ones in black AB – again, to add to the sparkle (because a twisted bugle will sparkle more than a non-twisted one). 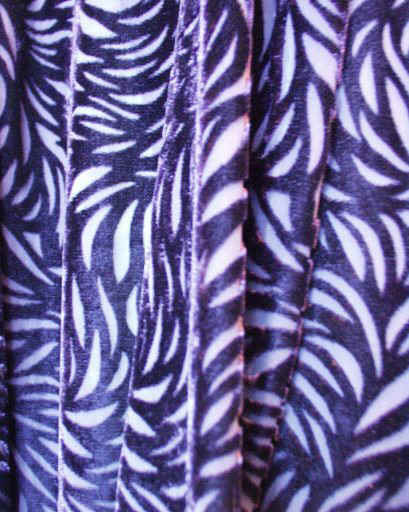 Ten years ago I bought two 288-yards-spools of Soutache from Cheeptrims; one white, one purple. 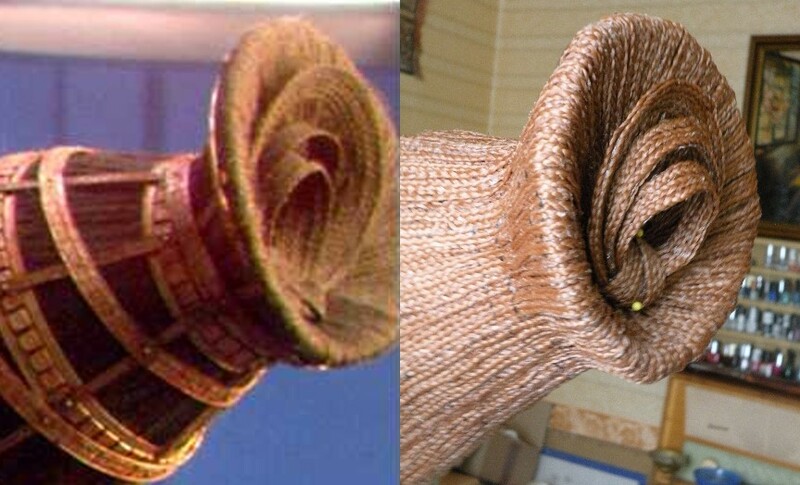 Those two poor spools have survived three house moves and one flooded basement after a tornado, so they’re not exactly in best shape – but the soutache on them is still good. As you can see, the spools and labels are basically the same (except for the labels having different color codes). And actually, both labels have a “RYN” on them, specifying that the content of the soutache is rayon, which is dyeable. 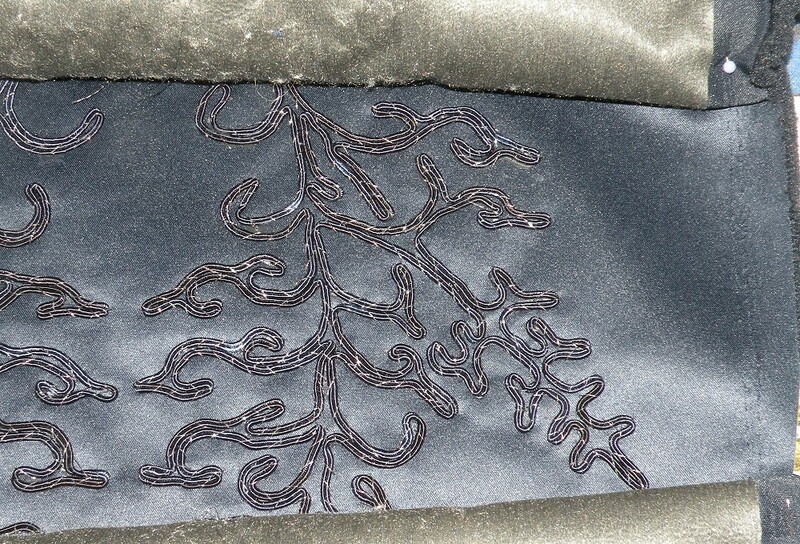 Over the years I’ve used quite a bit of the white soutache and dyed it successfully (of course – it’s rayon, right?). 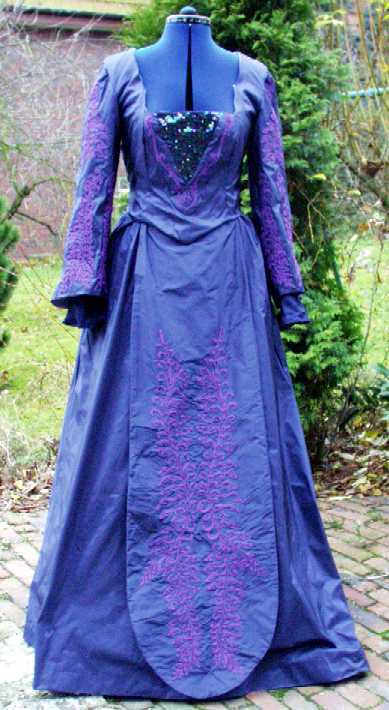 Now, when it came to soutache for this Senate gown reproduction, I thought “why not use the purple soutache and dye it navy?” – not unreasonable, right? 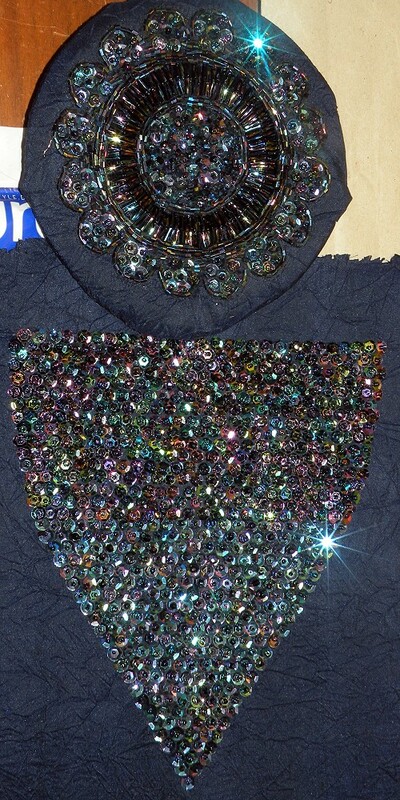 So I put approximately 100 yards of the purple soutache on a loosely spooled plastic card (to be able to dye it properly), and tried to dye it. Guess what? It didn’t take the dye at all. 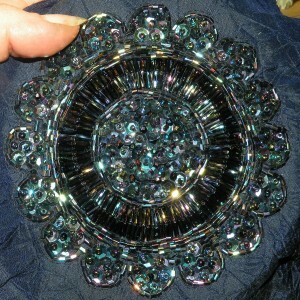 So I put ANOTHER 100 yards of the WHITE soutache on such a plastic spool, and dyed that. Guess what? It took the dye PERFECTLY. 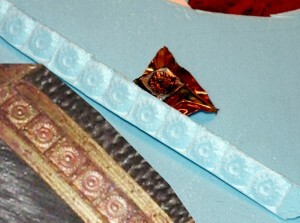 Here’s a picture of both the original spools standing on the plastic cards with the dyed soutache. You will notice almost no color difference on the purple dye batch (compared to the original spool color, that is) while the white clearly turned navy without problems. 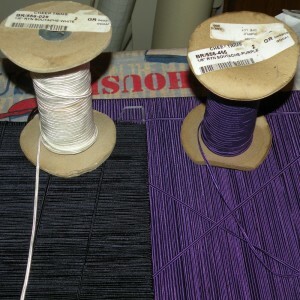 Cheeptrims obviously MISLABELED the purple spool. 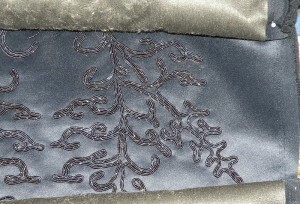 That purple soutache, as similar as it may look to the white soutache, is made from polyester; while the white soutache is indeed rayon. I confirmed that with a burn test of the fibers – the white soutache burns like a candle, smells like burned paper and crumbles into fine ash; while the purple soutache burns with a bright flame, smells like burned plastic and turns into hard blobs of molten plastic. So much for “soutache doesn’t equal soutache. I’m building my headdress with the help of Pepakura and Blender. 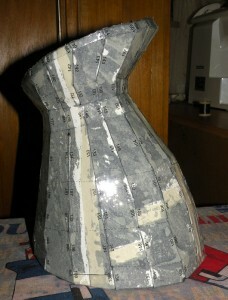 …and then I disassembled the object in Pepakura, printed it out on paper and then glued the paper to cardboard. 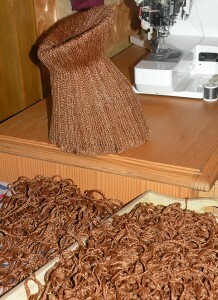 Here’s the microbraided hair which I’m using to cover the base of the headdress after a first washing. I chose a hair color close to my own (light reddish brown) rather than the original darker brown, because my own hair will still be visible at the front of the head. 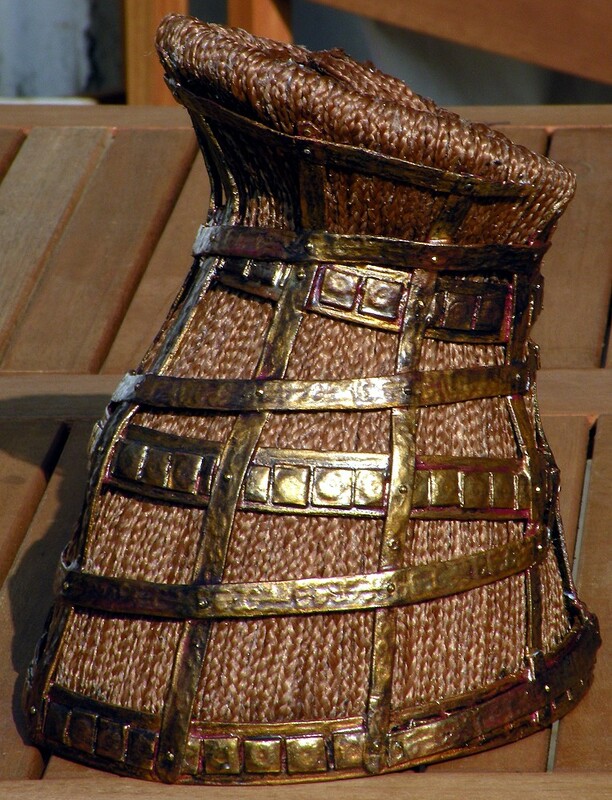 Here’s the headdress covered with felt, then painted with brown acrylic paint and a few initial braids glued to it. The markings are the placement for the cage above the hair. It took about 144 microbraids (not sure if I counted them correctly; so that’s just the approximate number) with lengths varying between ~16.5 inches (42cm) and ~10 inches (25cm). The difference in length is because you need shorter microbraids at the back and longer ones to cover the front. The top layer of the original gown is made of an etched silk velvet, and I was lucky enough to buy two bolts of the *original* fabric! 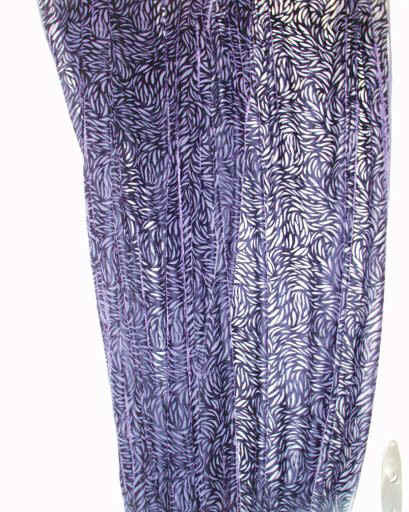 As I purchased it in white, it was still a risk to dye it. Would the colors (a dark, deep violet, having an unearthly, lighter purple sheen) be right? 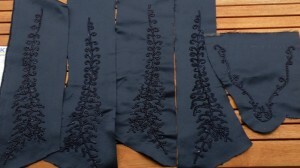 Next, and last, thing will be the overdress. 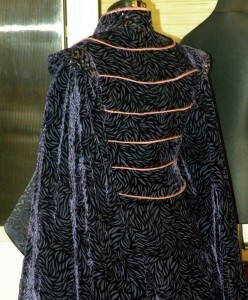 Here is the upper part of the overdress. The first picture shows about the right colors; but the second shows the better details. 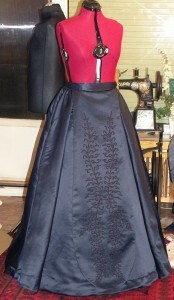 And here are the pictures of the finished gown. 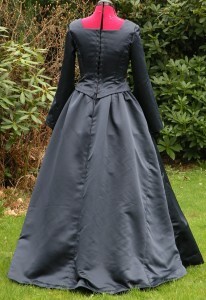 Unfortunately I have no pictures of the complete gown that were taken outside. 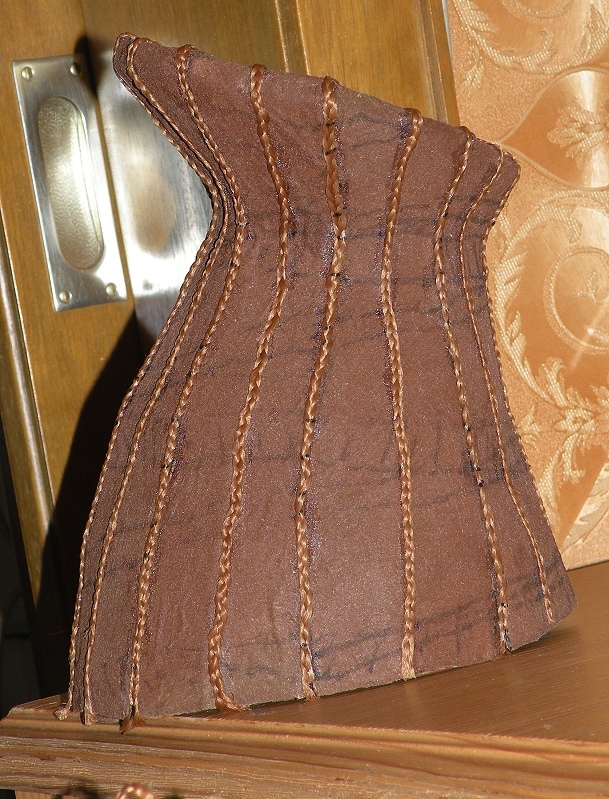 The colors are a little weird due to artificial light and flashlight; the real colors are more like the pictures that seem a little ‘dull’ – compare them to the pictures above of the underdress which were taken in daylight. Also, the hoopskirt that is under this gown is too small for this skirt; but the person I made this gown for has her own which is larger than mine. 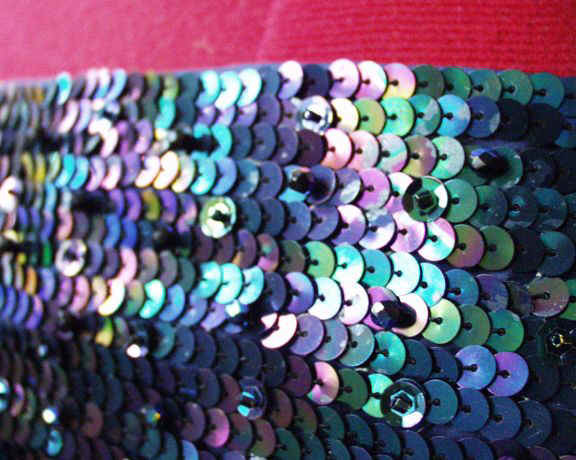 your dress is unbelieveble and I’m going to try to do it. But it’s very hard and I’m novice, I search differents pattern for the dress and I think it’s OK I Have just a problem for the embroideries. How can you do to draw itµ? For de gowm it’s more difficult especialy for the back ans the sleeves. Can you help me? 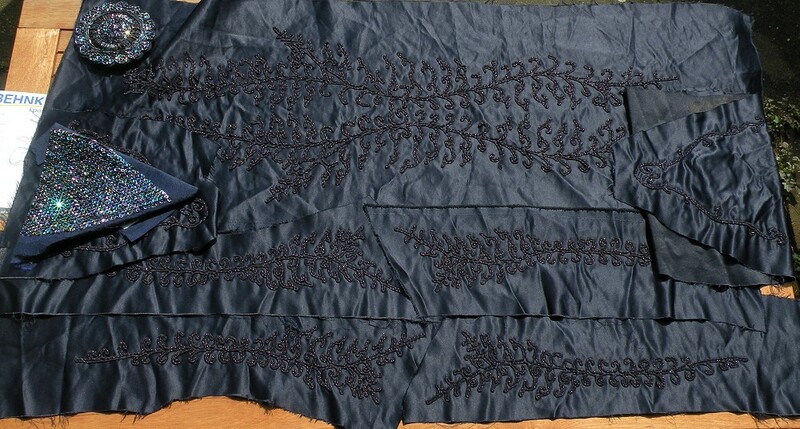 I am not sure what you mean by “draw the embroideries”. They are not drawn, as in with a pencil or paint. 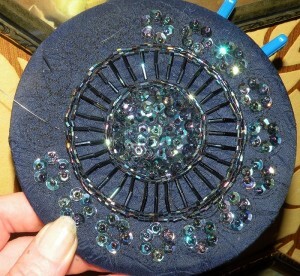 They are soutache braids, stitched to the fabric by hand. 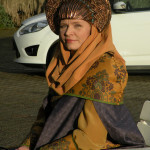 I was just wondering if you have any left over fabric for the velvet coat handy? 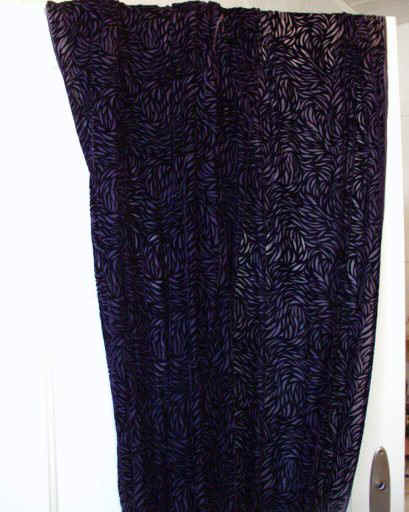 I do have some of the burnout fabric leftover – enough to make one dress! – but I do not sell it or give it away, sorry. Do you share or sell your Pepakura outline for the headdress? 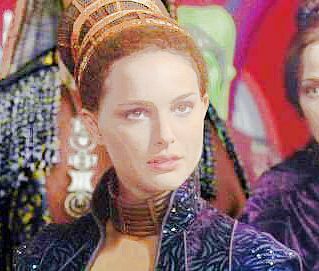 I’m making the costume to get into the 501st and i’m having a hard time finding a doable version of the headdress that goes with this dress. Thanks! To get into the 501st, making this dress won’t help since the 501st is the “bad guys”, so they won’t take anyone with this particular costume. Your best shot would be the Rebel Legion opposed to the 501st. 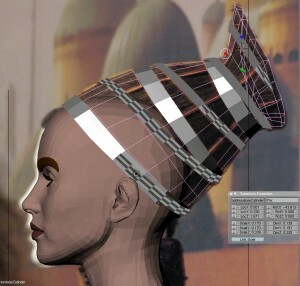 I will eventually post a downloadable PDF of the headdress. 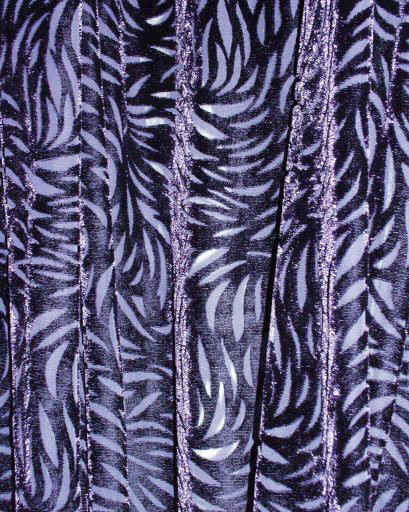 if you really can’t get any of the original flame velvet any more (and no, I’m not selling anything of the one and a half bolts I still have…), you could always try and etch the rayon / silk velvet yourself – I have instructions right here. It would take a considerable amount of time and patience, but it would work.